Why Did CNN Hire Comey’s Former Assistant Josh Campbell? CNN’s decision to hire former FBI Director James Comey’s assistant disturbs veteran members of the bureau, former agents told The Daily Caller News Foundation. 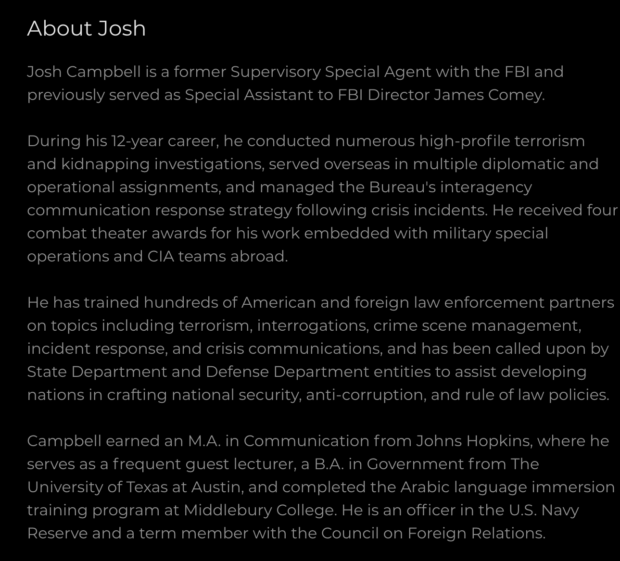 The relationship between former FBI agent Josh Campbell, the cable news network and Campbell’s seemingly close history with former boss James Comey, have raised a number of questions from these agents over the propriety of Campbell’s new job. “What can [Campbell] contribute? 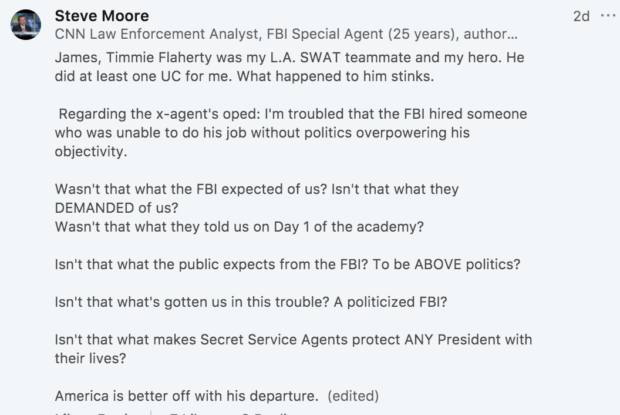 I don’t think that he would be someone who could offer any type of, really, knowledge about what law enforcement analysts are, because, what is his experience?” said former Special Agent Jack Garcia, a 26 year FBI veteran. Garcia and another 25 year veteran of the FBI noted to TheDCNF that Campbell’s mere 10 year career was largely marked by time spent at headquarters and that he lacked field knowledge to accurately represent the bureau. Campbell’s last job in the FBI was spent in a media relations role out of the Los Angeles field office. The flyer includes a photo of Campbell at the set of CNN New Day in New York City despite his job posting at the Los Angeles field office at the time. Campbell’s online history, reviewed by TheDCNF, shows a reverence for CNN and Comey. Since joining CNN, Campbell deleted his personal website, which included numerous photos of himself with Comey. 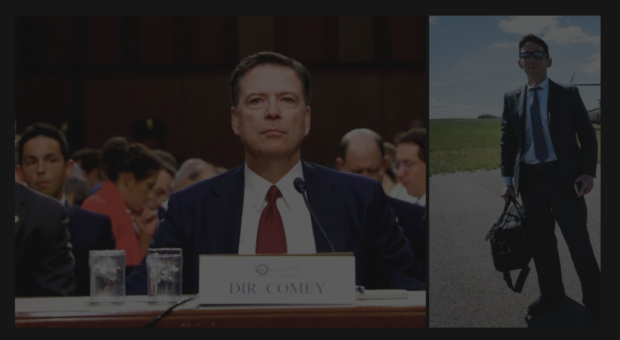 In the sites featured image, it shows a photo of himself sitting behind the director during congressional testimony which Comey delivered after President Donald Trump fired him. Campbell appears to have attended the testimony with his future CNN colleague and former U.S. Attorney Preet Bharara. Individuals who worked at the FBI during Campbell’s time greatly dispute this characterization. Comments on Campbell’s LinkedIn profile corroborate the described sense of anger by other agents. 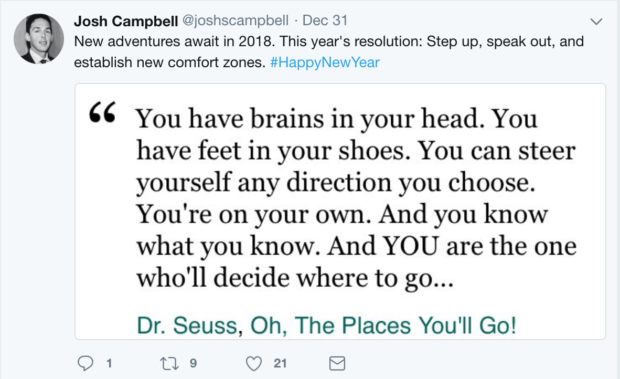 A review of Campbell’s Twitter account appears to show a reverence for CNN in the last month after a cryptic New Years Eve tweet. The day after his tweet he “liked” the network’s infamous ad comparing Apples to Bananas on New Years Day and encouraged people to donate to CNN’s Heroes campaign. Both Campbell’s presence at the Comey hearing and much of his social media activity occurred while he was still an employee at the bureau. This raises questions about their relationship following the former FBI director’s termination. It remains unclear why he attended his former bosses’ hearing while an active agent. “[Comey is] a giant of a man with an even bigger heart, whose focus was always on trying to understand and improve the lives of others,” Campbell wrote while still a member of the FBI in an op-ed for USA Today. FBI veteran agent James Gagiliano noted in an op-ed for The Hill that such outspokenness was baffling given his low rank. “What struck me odd at the time — having retired in 2015 after serving for 25 years in the FBI agent and executive management ranks — was this: Who afforded a GS-13 bureau employee the privilege to have a personal opinion piece published?” Gagliano said of the op-ed. Months later, on Feb. 2, Campbell published a separate op-ed in The New York Times, describing why he was resigning from the bureau. He also complained in the piece about how the agency had become a political target, which drew much of the criticism by former agents seen on Linkedin. Comey almost immediately shared the column on his personal twitter account and said Campbell’s” voice is an important addition to the national conversation.” On Monday, Campbell premiered on CNN. The FBI declined to comment on Campbell’s departure. Given Campbell’s inexperience at the FBI and relatively young age of 34, a DCNF source with close ties to the FBI alleges that Comey had a direct hand in securing his new CNN position in return for an exclusive interview. A Fox News report published Wednesday alleges a similar type of deal between the parties. CNN has not disclosed Campbell’s previous history with Comey, nor did it respond to several requests for comment from TheDCNF. Comey, who has faced repeated scrutiny from both parties over his handling of both the FBI’s criminal investigation into former Secretary of State Hillary Clinton’s private email server and its ongoing probe into possible Russian electoral meddling, benefits greatly from a close confidante on a major news network — particularly in the wake of an upcoming Inspector General report reviewing the agency’s handling of these cases. As TheDCNF reported earlier this week, CNN has repeatedly relied on anonymous sourcing within the FBI for its stories. The former agents who spoke to TheDCNF expressed bewilderment that an active agent would so nakedly share his relationship with a news outlet, with the most conspicuous example being his party flyer showing him sitting in a CNN studio. Comey’s attorney, Daniel Richman, declined to comment.